Fabio Pinca (Republic of France) vs.
Tiffany Van Soest (USA) vs.
FRMT │ 143 lbs. │ 5×3. Chris Culley (Victorville, CA) vs.
Travis Clay (Chandler, AZ) vs.
FRMT │ 130 lbs. │ 5×3. Tickets are available online at www.pechanga.com │ by calling Pechanga’s Box Office at 1-877-711-2WIN │ or by visiting Pechanga’s box office. See more at: http://www.lionfight.com/events/lion-fight-27/. Lion Fight XXVII airs live on AXS TV at 10 p.m. ET/7 p.m. PT. 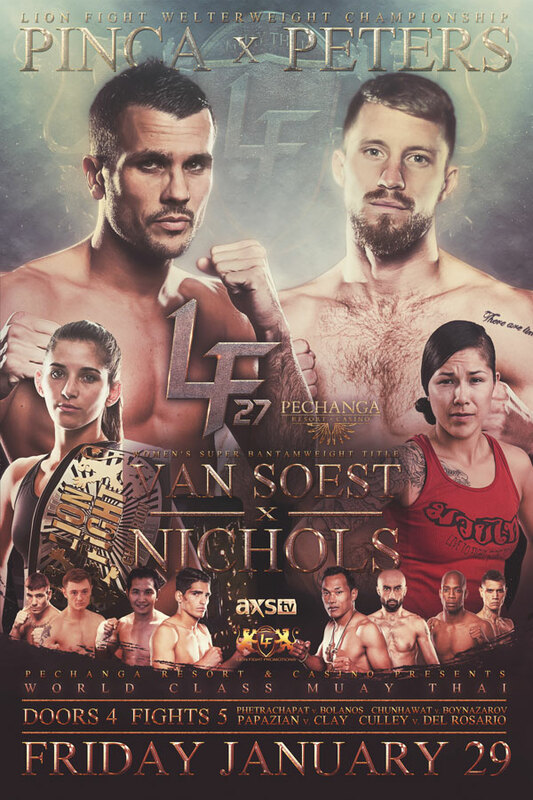 This entry was posted in Events, Features and tagged Anvar Boynazarov, Ashley Nichols-Kew, Brian Del Rosario, Charlie Peters, Chris Culley, Fabio Pinca, featured, Gaston Bolanos, Jared Papazian, Kronphet Phetrachapat, Lion Fight 27, Muay Thai, Pechanga Resort & Casino, Phanuwat "Coke" Chunhawat, Tiffany Van Soest, Travis Clay. Bookmark the permalink.